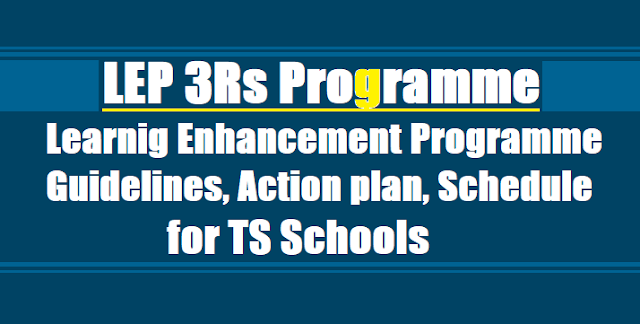 Learning Enhancement Programme (LEP) in TS Schools to 3Rs Basic Competencies improvement. ~ Class I and II Text books may be used for the strategies to improve the basic competencies. ~ Develop plan of action for improvement with specific targets. III. PostTest/End line Test: At the end they should conduct one end line test and furnish the report on progress to the concerned School Complex Head Master and Mandal Educational Officers. All the School complex Head Masters are responsible in their complex area for the implementation and improving the basic competencies. 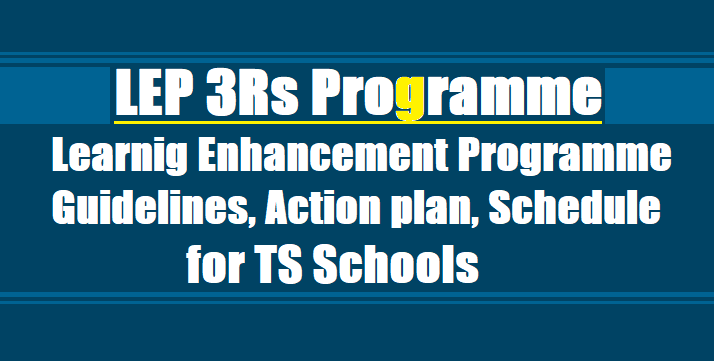 Subject: RMSA Telangana Hyderabad - Implementation of Learning Enhancement Programme (LEP) in High Schools and Elementary schools in the State to improve the foundational skills of reading, writing and arithmetic and also class specific skills - Implementation guidelines issued - Reg. All the RJDSEs and DEOs in the State are hereby informed that, vide subject cited it is proposed to implement learning enhancement programme(LEP) in High Schools and Elementary schools in the State to improve the foundational skills of reading, writing and arithmetic and also class specific skills during the academic year 2017-18. The programme of LEP is to be implemented for a period of 50 to 60 days from 01.08.2017 onwards duly completing required training and conduct of baseline before 30th August 2017. • Each DEO shall identify 3 School Assistants from each Manda! i.e. 1 each for Telugu, English and Mathematics. Good committed and expert School Assistants in their subject shall be identified. These DRPs will be trained for l day by the State level RPs in the Districts. The DRPs will in turn trained teachers of both Primary and High Schools on LEP in the school complex meetings. The State level RPs will be deputed to the schools for conduct of the training. The budget for the training will be from the funds of RMSA and SSA @50:50. The DEOs are directed to use the available funds from RMSA and SSA with them for the district level training programme. The norms of expenditure will be as per the guidelines issued earlier for teacher training during June 2017. • District level training for the RPs @3 per Manda! for one day at District Head Quarters on 20th, 21st and 22nd July 2017 @10 Districts per spell. The District level training schedule is given here under. • (@3 RPs i.e. Telugu, English, Maths from each Manda! particularly SA/LFLHMs) The list of districts date wise and RPs allotted is enclosed. Baseline test for all the students of Primary, Upper Primary and High Schools shall be completing before 29th July 2017. • Learning enhancement programme implementation shall be implemented in all High Schools of Govt. ZP, Aided, Model Schools, KGBVs, Residential Schools up to 45 to 60 days from 27.07.2017. • Learning enhancement programme implementation shall be implemented in Primary and Upper Primary schools including aided up to 45 to 60 days from 01.08.2017. • All teachers in High Schools, Model Schools, KGBVs, Residential schools, Upper Primary Schools and Primary schools shall participate and take up the responsibilities duly discussing in the staff meetings along with fixing targets and class wise and subject wise responsibilities. The subject teaches shall take the responsibility of teaching class specific basic competencies for the children those who can performance 3RS. • The Headmaster shall convene a staff meeting in all types of schools and discuss the LEP programme i.e. both foundational and as well as class specific competencies based on the module and guidelines issued and develop the time table along with distribution of subject specific responsibilities/ duties. • The Headmaster shall convene a review with the staff on weekly basis to discuss the progress over baseline. • All the School shall conduct end line test at the end of the LEP programme ie., last week of October 2017 / First week of November 2017 and keep ready the progress and also furnish to the State. The State level teams shall verify the progress in the schools. • The observers from State and Districts will be visiting the schools and observing the implementation of LEP and responsibilities taken up by the teachers and HM staff meetings minutes. • The MEO shall visit the 3 or 4 Primary and Upper Primary schools on daily basis and record the observations and write the suggestions in the observations book at school. • The DEO shall visit the 3 or 4 Primary, Upper Primary and High schools on daily basis and record the observations and write the suggestions in the observations book at school. The DEOs are directed to use the services of DRPs trained and LEP as observers to the schools to observe in the same Manda! and support to the teachers and clarify issues for effective implementation. The school complex HM shall monitor the implementation of LEP programme in the complex area and also take the RPs with them. The MEOs and school complex HM shall plan for the training and as well as monitoring in the districts and review the progress during school complex meeting. the State level RPs on LEP shall visit the Manda! level trainings pertaining to Primary and High Schools during July as per the dates as above and submit report to the C&DSE and Ex-Officio SPD. A review meeting with the State level RPs will be on 31.07.2017 where the present district reports. Th~ State level RPs TA, DA etc. will be paid from State level RMSA and SSA. The DEOs are directed to relieve the RPs as per the list enclosed to the programme at State level on 18.07.2017 and also to the District level programmes as per the dates enclosed.